From beginner to pro, and everything in between. No matter where you are in your throwing development this Master Class will accelerate and refine your throwing skills. Suitable for complete novices through to those who can already throw. You will be challenged at your level to learn and refine your motor skills, your clay knowledge, your process knowledge and your finishing skills at every class. This class approaches learning to throw as an apprentice would learn. If you are prepared to go back to the very beginning and train new habits, even a seasoned thrower will improve their skill! For a novice thrower – learn once and learn well! You will be set up with skills you can cherish for life! This class is limited to 8 students who are committed to completing the entire course. If you are unsure of your desire to learn to throw, please book in for a one-on-one class with Lynda. However, these courses do fill quickly, so don’t hesitate! 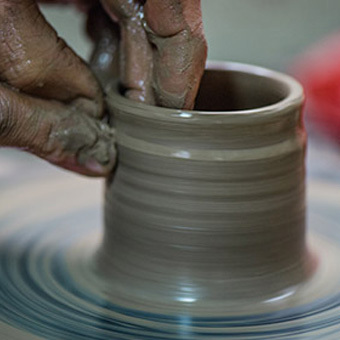 *** Students who book online before 22nd May 2019 will receive a FREE FIREBIRD STUDIOS COMPACT POTTERS WHEEL to take home and KEEP! Plus a bag of clay. Practice is vital and we want to help you achieve to the highest level! ***Payment Plan – 3 x $400 – final payment must be made on or before May 8th to secure your place. Please indicate the number of payments you have made in the appropriate place when you book. Thank you. Out of stock! Potters Wheel Master Class Payment Plan - 3 x $400 - final by May 8th $400.00 Please ensure you make three payments of $400 each - final on or before May 8th. Indicate the number of payments you have made in the appropriate place when booking. Thank you.